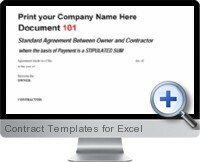 Contract Templates are purpose built Excel templates for contract work undertaken by engineers, builders and architects in the contruction business and can be adapted for any type of contract work. The Contract Templates are based on American Institute of Architects and the Associated General Contractors of America (AIA and AGC) standard formats in order to adhere to regulations and can be quickly customized for specific contracting requirements. Many of the calculations are automated. Simple to use as looks professional. Use the templates as many times as reqired. Easy to customize to specific needs. Standard Agreement Between Owner and Contractor where the basis of Payment is a stipulated sum. Standard Form of agreement between Owner and Contractor. Abbreviated Standard Form of Agreement Between Owner and Contractor. Contract between Engineer and Contractor. Contract between Engineer and Owner. Standard Agreement Between Contractor and Subcontractor. Contract between Subcontractor and Contractor. Abbreviated Contract between Contractor and Subcontractor for Projects of a Limited Scope. Standard Agreement Between Owner and Construction Manager where the Construction Manager is also the Contractor. Abbreviated - Standard Form of Agreement Between Owner and Architect. Contract between Architect and Owner. Contract between Owner and Contractor for Demolition of Structure. Contract - Time and Materials Basis. Independent Contractor Contract - Construction Worker. Contract between Owner and Contractor for Demolition of House where the basis of payment is a stipulated sum. Contract between Owner and Contractor for a New Home. Contract between Owner and Contractor for a New Home Plus a fixed fee. Contract between Owner and Contractor for a New Home Plus a % fee. Contract - Residential Specifications for NEW HOME. Contract - Residential remodel Specifications. Contract - Residential - Proposal. Notice of Right of Rescission to Owner. Notice of Right of Rescission to Subcontractor. Notice of Rescission to Contractor.